Margaret Somerville appears on The Source with Ezra Levant to discuss the moral and ethical problems with legalizing euthanasia and assisted suicide. The most important question to ask is, is society either authorizing someone to kill other people or authorizing them to help them kill themselves, is that morally wrong? […] The problem with assisted suicide is that society has to become complicit in it and society has to say, “we’ll authorize this,” and society has to change its laws to allow it to be legal, and its that complicity that I think is so dangerous and wrong… It’s a culture of despair, and the opposite of despair is hope[…] People who want euthanasia are not depressed, it’s usually not because of pain, but […] the state they’re in is hopelessness[… having] nothing to look forward to. Watch the whole 9 minute interview here. Danny wrote about Dr. Adrian Owen’s research on awareness and patients in a vegetative state last year, while Owen was in the UK. Now he’s the Canada excellence research chair in Cognitive Neuroscience and Imaging at the University of Western Ontario, and Steve Paikin sat down with him for a half hour interview on his work this past Spring [25min]. Very important research to keep an eye on regarding “end of life” issues. I’ve recently become a father. I am sure that pregnancy was designed not only to allow for the early development of the child, but also to give parents time to prepare. 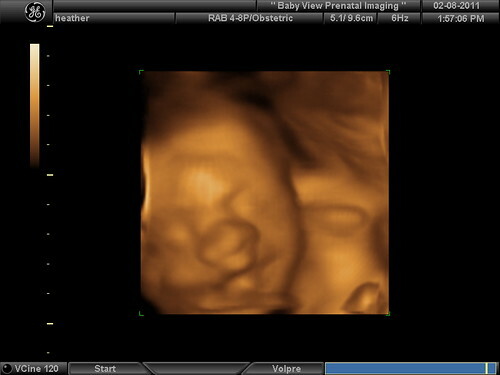 Still, in this period of anticipation, waiting to “meet” our child, it’s amazing how technology makes the pre-born child more visible than ever before. 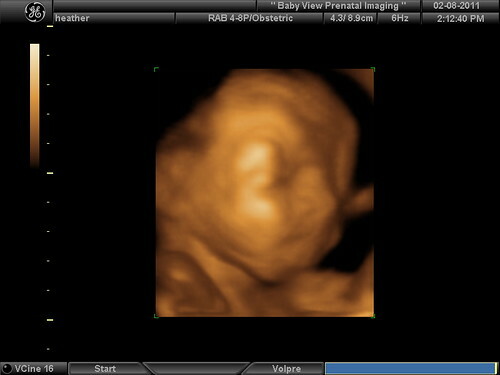 Here are some photos and a video from a 3D ultrasound around ~21 weeks after conception. 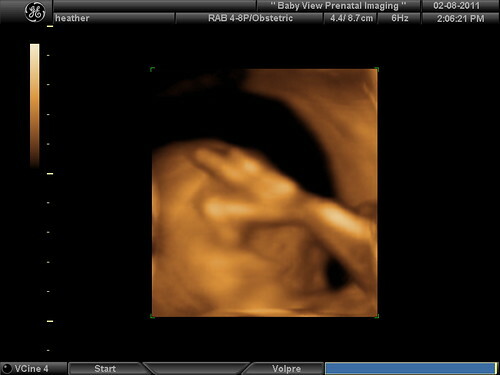 The 3D ultrasound video and photos are all licensed freely under a Creative Commons Attribution 3.0 Unported licence, which means you’re encouraged to share, remix, adapt, distribute the photos and video far and wide. Just… watch the whole thing. [Debate] Abortion: Human Right or Human Rights Violation? We’ve uploaded video from Monday’s debate between Stephanie Gray and Donald Ainslie. Unlike Stephanie’s opponent at Dalhousie, Ainslie did not argue in favour of infanticide, and in fact argued against the notion that abortion should be a morally trivial matter. Professor Ainslie affirmed that, from the point of conception onwards, there are deep moral issues at stake. We think of people as one of a kind, as irreplaceable. When an egg is fertilized there is a biological creature that’s one of a kind; there won’t be another one of those. And so the loss of that person, either spontaneously or… in an abortion, makes the world somewhat less. That’s one thing that the world doesn’t have anymore. . . . [it’s] the loss of something with intrinsic value, something that’s irreplaceable, something that won’t be around again. But Ainslie’s main argument was that, although the moral status of the pre-born is not insignificant, the pre-born doesn’t have the same moral status as you or I until some undefined later point in pregnancy (between conception and birth, which he labelled as two extreme lines to draw). Therefore, he argued that abortion is justified in some circumstances, that all abortion is morally significant but not inherently wrong. He argued that, though the pre-born has intrinsic value, that value might be outweighed by other considerations which justify abortion. Further, he argued that though there may be moral questions involved, the legal questions are separate, and since reasonable people could disagree on the moral question, abortion should be legal. In essence, he affirmed the intrinsic value of the pre-born, but put it on a sliding scale of lesser significance than the intrinsic value of you or I until some undefined point between conception and birth, of a lesser moral status meaning that some abortions are justified and that the law should leave the possibility of abortion open. In one sense, Ainslie’s argument was weak insofar as he purposefully avoided making any claim of where or why or how the pre-born child would attain a greater moral significance at some arbitrary part along the human continuum of development between conception and birth. This is a classic case for the SLED argument. But in another sense, I believe his argument is challenging because — despite avoiding the question of why size or level of development (essentially, our age) should determine our value — many people simply agree with this type of argument. They often can’t articulate a reason for it, but they’ll deny that abortion is inherently wrong in the first trimester while being uncomfortable or opposed to it later on, because they believe there is a greater moral significance as the pre-born child gets older. To respond, I think we must highlight the fact that our age does not increase our value or our moral significance, and make the pre-born child more and more visible, using images of prenatal development that bring to light the undeniable humanity and intrinsic value of the youngest human beings, and images of first trimester abortions that bring into the light the horrible injustice and violence of abortion even at an early stage. You can read the entire statement of claim from their website. That same eventful month, October 2010, the Pridgen Precendent was set. In ruling against the University of Calgary, Justice Strekaf said that a university campus is “not a Charter free zone” (though it didn’t deal directly with any pro-life student club issues). I believe that ruling is still being appealed. This will be yet another critical case for pro-life students and organizations across Canada. Carleton Lifeline is also still considering legal action against the student union if they continue to discriminate against the club as well. It’s hard to count the number of pro-life clubs under attack across the country in similar ways, so kudos to Ruth Lobo and John McLeod for taking a stand. And, hey, they’re accepting donations to help cover their legal fees. Sometimes, it’s hard to know where to begin, so I’ll just tackle it line by line. Legalized abortion and a woman’s right to choose is a topic that has been under fire by religious-based organizations for years. Religion is the focus in the opening sentence, yet watch how little it has to do with the topic of the article, and who’s bringing it up when it’s mentioned. Nevermind the fact that most campus pro-life groups — the primary subjects of her article — aren’t religious organizations. Perhaps it used to be the popular opinion that abortions should remain illegal, but it also used to be a popular opinion to keep slavery alive in the United States. Comparing a push to make slavery illegal with a push to make abortion legal? This betrays incredible intellectual dishonesty, or an incredible void of historical knowledge. If anything, the comparison between abortion and slavery weakens the pro-choice stance. The stronger comparison is between those who sought to outlaw slavery and those who seek to outlaw abortion. In the case of slavery in the United States, human beings were denied personhood because of the colour of their skin or their racial background. In the case of abortion, human beings are denied personhood because of their size, or location, etc. In both cases, dehumanizing rhetoric serves to justify dehumanizing treatment. The n-word wasn’t just offensive, but it was dehumanizing language that serves to support slavery or other civil rights atrocities by attacking the humanity of the African American. We don’t commonly use cold, scientific terms to describe human beings after they are born, but before birth, pro-choice advocates stick to terms like fetus, embryo, blastocyst to dehumanize pre-born children. This dehumanizing rhetoric and denial of personhood is a common denominator to the worst human rights abuses, and especially to slavery and abortion. To take a subsection of the human population and say that these are human beings but not persons is the very formula of a human rights abuse. I could go on, but Dellapina’s article gets more absurd (and we’re only two sentences in!). What is right and what is wrong is subject to the individual, as opinions will always vary, which is why Canada has legalized abortion. Moral relativism as a defence of abortion is not surprising, but as a defence of slavery? Moral relativism didn’t and couldn’t abolish slavery. (“No one is forcing you to own a slave, but you have no right to impose your morality on others and prevent them from owning slaves if they want to!”) Slavery was abolished because the abolitionists made an objective, moral argument. It didn’t matter that some Southerners believed slavery was okay. The abolitionists said it was objectively wrong — wrong in the North, wrong in the South. They challenged the legality of slavery with moral arguments, in defence of the humanity of those whom society, the courts, the government would deny personhood. If what is right and wrong is subject to the individual, we have no right to make slavery illegal. The comparison of abortion to slavery does not bode well for a pro-choice argument which relies on moral relativism to succeed. Samantha, if Canada legalized abortion because “what is right and what is wrong is subject to the individual,” and “opinions will always vary,” then why shouldn’t Canada legalize slavery? This allows individuals to make their own personal and private choices in the matter, without having a law make it for them. Just like the law denied individual slave owners to make their own personal choices about their own property. But we created laws to deny them that right because we recognized that slaves should not be treated as property, but as persons. Abortion is not a personal or private choice either — it involves denying the personhood of another human being and ending an innocent life. 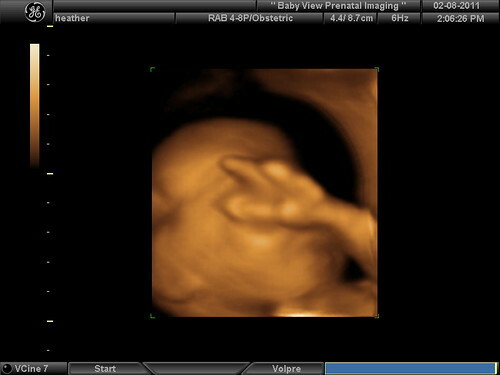 What pro-lifer’s need to understand is simple: what happens in my womb has nothing to do with them. What abolitionists need to understand is simple: what happens on my plantation has nothing to do with them. The property arguments of slave owners only worked for so long. It’s ironic that Dellapina would employ a property-based argument right after comparing abortion to slavery. I had almost begun to believe the debate had retreated into the background, with more important topics taking the forefront, like the war in Afghanistan, global warming, cholera in Haiti, or Sarah Palin’s new reality television show. It appears however, that in Universities across the globe, pro-lifer’s still exist! Has Dellapina not been following Canadian politics? Or campuses? Has she searched the web? There was just a vote in the Canadian parliament on a bill to explicitly outlaw coerced abortion (the vote was after the article was published, but the bill was tabled months ago), the Liberal Party was freaking out earlier this year over the Harper government’s approach to exclude abortion from its maternal health initiative, the “biggest-ever” March for Life took place this past year on Parliament Hill with an estimated 15,000 participants, and pro-life campus clubs have consistently received media attention in their freedom of expression battles with university administrations and student unions across the country, with support of organizations like the BC Civil Liberties Association. It can be helpful sometimes, as a writer, to make the reader feel smarter than you, but not to give the reader the impression that your head is firmly buried in the sand. Let’s give her the benefit of the doubt here and assume it was a poorly executed joke. Ah, right, the peaceful demonstrators who were hand-cuffed and hauled away in a police van for trespassing on their own publicly-funded university campus. … After watching the arrest on YouTube it is clear the group was looking for confrontation when they were given many chances to simply move their display. Perhaps they took the arrests as a way to publicize their anti-abortion argument, and in a way, it has worked, because here I am writing about it. Though how much it has worked in their favour has yet to be seen. Watch the video yourself. There’s a big difference between not backing down when you’re being bullied and denied freedom of expression, and “looking for” confrontation. Carleton Lifeline was not looking for confrontation with the administration, and certainly didn’t expect the police to be called in to arrest them for peacefully demonstrating on their own campus. But they weren’t willing to let the administration intimidate them into silence (or “protesting indoors only” — which is practically the same). They were willing to risk confrontation with the administration and stand up for their rights (and the rights of others), but they didn’t go looking for the police. About a month after the arrests, CUSA made another huge stride in silencing LifeLine, by completely denying the group status and funding. The decision to cut the club comes directly from Khaldoon A. Bushnaq, Vice-President of Internal Affairs for CUSA, explaining that the club’s constitution is in violation of CUSA’s Discrimination on Campus Policy, which supports a “woman’s right to choose.” Enraged, Ruth Lobo—president of LifeLine—said, “I will never get over the shock that there is a discrimination policy that allows them to discriminate against us.” No Lobo, there is a discrimination policy in place to prevent you from discriminating against women. The CUSA discrimination policy says that people and groups with a particular political view — that abortion is in any way unacceptable at any time — are denied privileges that other students have, while still being forced to pay dues to the student union. That sounds like discrimination to me. Holding up GAP signs may challenge or offend, but it doesn’t actually exclude anyone from anything. I recommend reading Carleton Lifeline’s first response to CUSA on this issue [PDF]. Aside from having a discrimination policy that discriminates against pro-life students, they didn’t even follow their own procedures outlined in their own constitution. If this isn’t resolved within the university, it’s likely to be resolved in a courtroom [PDF]. It’s hard to tell if Dellapina is pretending that only “religious-based organizations” are concerned about the freedom of expression issue, or if she simply didn’t search the web. Also, last I checked, the Canadian Civil Liberties Association didn’t report to the Vatican. Perhaps LifeLine should have seen this coming and kept their little display contained in Porter Hall. Their “little” display? That Dellapina feels deserves her attention, in Scarborough, two months after it happened in Ottawa? It’s just pettiness seeping through here. It was only in April of this year, that the University of Calgary notified eight members of the Campus Pro-Life student group that they have been found guilty of a major violation under the Non-Academics Misconduct Policy… The CPL President, Alanna Campbell, has told the press that she would “rather be expelled as a principled person than graduate a coward.” The Messenger presses Campbell to continue to challenge the verdict in hopes that she will discover the imbalance in her life’s priorities. If only the University of Calgary were so confident. They’ve already lost a big case on the question of whether the Charter applies on campus — a case that they’re appealing, because it spells disaster for their conflict with Calgary Pro-Life. But even the University of Calgary, for all it’s done to intimidate pro-life students, hasn’t had them dragged off campus in handcuffs. … The Canadian Government closed the books on the debate over a woman’s legal right to abortion in 1988, when the Supreme Court of Canada ruled in R. v. Morgentaler that the existing laws were unconstitutional and therefore struck them down. That’s… not exactly true. I’m not sure Dellapina understands the difference between the legislative (Parliament) / executive (Prime Minister, Cabinet, Government Departments, Civil Service) branches of government, and the judiciary (the Supreme Court of Canada, in this case). The Supreme Court of Canada struck down the existing laws as unconstitutional, due to the “manifest unfairness” of an awkward administrative procedure involving committee approval required by the old law. Parliament attempted to pass a new law, but it was defeated in the Senate in a tie vote. No subsequent government has revisited the situation as of yet. Today in Canada, Medicare covers the costs and the law requires clinics to be funded across provinces. Right after trotting out the old “debate is closed” line, Dellapina reminds her readers that abortion is publicly-funded with taxpayer dollars… meaning, it’s absolutely a legitimate subject of public, political debate. What strikes me most about LifeLine, Students for Life, and Campus Pro-Life, is that they intend to take away a legal right in a country that is supposed to represent liberal culture. The desire to remove this fundamental right from women seems equal to taking away their right to vote, or freedom of religion, and then where does it end? All I can say is… don’t you have a paper to write or an exam to study for? It’s so odd to open the article with an invocation of the fight against slavery, and then to make arguments like this. First, women were denied a right to vote because they weren’t considered persons under the law — same as slaves, same as the unborn. To equate “freedom to kill your unborn child” with “freedom of religion” is utterly ignoring the second person affected by in the act of abortion. No one is threatening anyone’s right to cast a ballot, because casting a ballot doesn’t involve dismembering an innocent human being. Second, it’s not a legal right, but an absence of any legal barrier. There is no positive affirmation of some legal right to an abortion in Canada, nevermind as a “fundamental right.” There’s only a lack of any legal obstacles. Third, Dellapina invokes liberalism right after she brushed aside freedom of expression issues that are on the radar of civil liberties associations across the country and applauded the “huge strides in silencing” political views she disagrees with. Last I checked, freedom of expression was a fundamental right in a true liberal democracy. Erm… which law would that be? 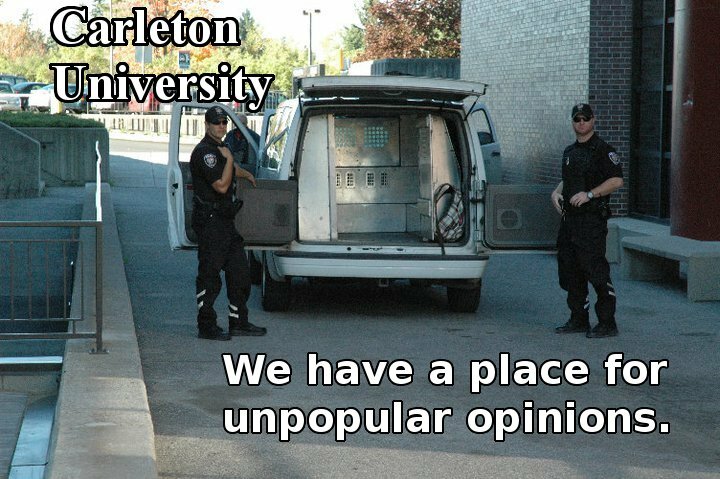 The club failed to respond to The Messenger regarding the recent events at Carleton University, among other questions, but fortunately for us they have a website. Yes, we did. Sorry. Seeing the final product of Dellapina’s article, I can only imagine how our words might have been twisted, but, honestly, there was no deliberate attempt to avoid comment. We honestly missed the email until recently, well after the article was published. We were busy, you know, writing papers and studying for exams. Our mistake, but not an intentional snub. I guess it wasn’t clear from the website, but for the record, the protest was on Wed Nov 10 — the videos went up the next day. … I was able to breathe easy watching the video posted on the Students for Life website once I could hear the overpowering voices of pro-choice students silencing the pro-lifer’s. Our megaphone-wielding friends shouting slogans from the 70s certainly aren’t surprised to find pro-life opposition on campus, since that was the probably the 15th or so public pro-life demonstration I’ve participated in since beginning my studies on the St. George campus in 2005. As much as I oppose the pro-life opinion, believe it is backwards and should have no place in politics, I still believe everyone has a right to have an opinion. That’s kind of her, not to question are right to… uh… think for ourselves? Though, within the walls of a University, I do not believe there should be any room for these opinions. Spoken like a true supporter of liberalism and academic freedom. Keep them in your house, talk about them over a beer, join a pro-life group that isn’t affiliated with an educational institution, have a baby when you get pregnant, but get off my campus! Hey, kind of like don’t ask, don’t tell, but for your political opponents! The Messenger wants to know what YOU think. Email your opinions to utscmessenger@gmail.com with the subject: ABORTION. Email us! Because the debate is over, and you should keep your opinions to yourself! Samantha, I’m sorry we didn’t answer your request for comments earlier. Maybe we’ll take up the questions in another post soon. You said in your email to us, “I think your voice is important regarding this issue.” I’d like to think you meant that (and not just when we keep our opinions to ourselves). But if our voice is important on this issue, why are you so eager to applaud the efforts to silence the voices of Carleton and U of C pro-life students? If you were really a supporter of authentic liberal democracy, and of universities and academic freedom, you wouldn’t be applauding the silencing of people with whom you disagree. If you take an honest look at abortion in light of slavery, I think you might understand our perspective a just little bit more. The debate clearly is far from over, as evidenced by your article, as evidence by events at Carleton, as evidenced by events on Parliament Hill. As confused as it may be, I think your voice is important in the debate too, and I certainly wouldn’t applaud anyone seeking to silence you. As a supporter of a true liberal culture, you may want to reconsider rooting for those who seek to silence expression with which they disagree. As long as innocent human beings are denied personhood, dehumanized and killed, pro-lifers will exist. As long as pro-choicers seek to silence any dissent on the issue, pro-lifers will take a stand — on this campus, and across the country.